It’s finally available to the general public! Daemonic Prosperity Magick! 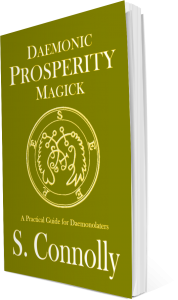 Written exclusively for experienced Daemonolaters, in Daemonic Prosperity Magick, learn how money magick with Daemons works. This book gives you PRACTICAL Daemonic magick to bring more prosperity into your life! Included are the six best Daemons for wealth, prosperity, and career success – including Clauneck – and formulas on how to double your cash, or take your career to the next level. Included in the paperback and hardcover editions is a bonus section on Sorath to catapult your work into the spotlight. From basic traditional witchcraft to shadow work and meditations, to more ceremonial rites and petitions – it’s all in this book and it all works! The author personally tested every ritual in the book multiple times and only included formulas that were successful every time. Results may vary based on talent and work ethic. Paperback and Hardcover include over 35 additional pages of BONUS CONTENT including a whole section on Sorath, all sigils, and 11 MORE rituals! This entry was posted in books, Magick, new releases, S. Connolly by Steph. Bookmark the permalink. Hi Steph, i have a little experience working with demonic magic but i would love to learn more. Would you recommend i purchase the book?